WILL THE WORLD END ON DECEMBER 21, 2012? NO, BUT ... IN THE NEAR FUTURE! UPDATED INFORMATION - YouTube: " "
The Mayans:The Mayan Long Count calendar, dating back to at least the 6th century BC, has greater significance to us today because the end-date for this calendar is fast approaching. The Mayan’s were a particularly advanced civilization, and their calendar was one of their greatest achievements. The Mayans:The Mayan Long Count calendar, dating back to at least the 6th century BC, has greater significance to us today because the end-date for this calendar is fast approaching. The Mayan’s were a particularly advanced civilization, and their calendar was one of their greatest achievements.The ancient Mayan Long Count calendar ends on December 21st, 2012. Although this is obviously just a date and the calendar had to end sometime, rather than spiral into infinity, there is general uncertainty among many people as to what this means. Why does the calendar end on this specific date, and does it hold any significance for us?2012 Doomsday:Some people think that 2012 Doomsday will bring the end of the world, or at the very least we will see catastrophe and destruction on an epic scale. Let us not forget the wholesale panic and confusion that the approaching millennium brought us. The World was going to end on New Year’s Day, 2000. Obviously it didn’t, as we all lived to ‘fear’ another day. Now we need a new date to dread the approach of.Many more people think that 2012 Doomsday might not be such a bad year and this date might bring a “new beginning”, or a new enlightened era of human-kind.The Mayan’s were extraordinarily accurate when predicting the movements of the planets. 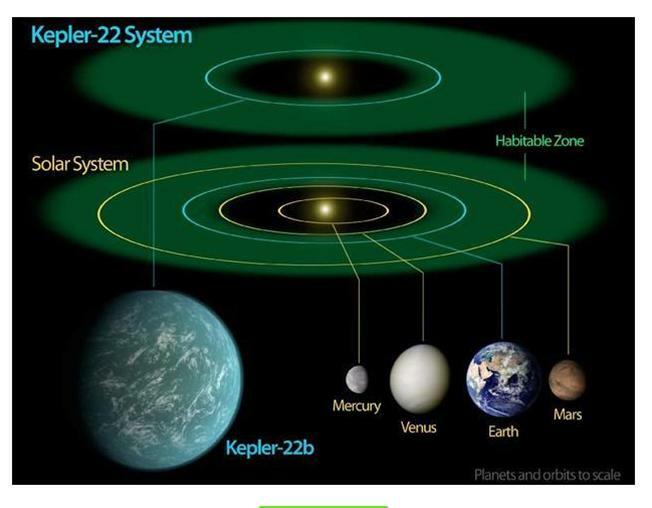 One theory is that on this date in 2012, the planets of our solar system will align with the center of the Milky Way galaxy.Planet X:Another theory is that a rogue planet, called Planet X, will either collide with the Earth or come close enough to cause catastrophic destruction. Planet X, often referred to as the 12th Planet, is also called Nibiru – a name derived from author Zecharia Sitchin and his works on Sumerian and Babylonian mythology.Nibiru is a planet-sized object that was first observed moving toward our solar system in the 1980s by scientists, although most scientists deny its existence. It is believed, by some people, to have already entered our solar system on a course that has brought it around the far side of the Sun, obscuring it from the Earth.Beyond 2012 Doomsday:The effects of a collision with the Earth would be disastrous. An asteroid colliding with the Earth would almost certainly result in an Extinction-Level Event, or ELE, but a planet-sized object hitting the Earth would probably result in the total destruction of our planet.Fortunately, the chances of a collision are extremely remote. Probably as remote as you or I winning the lottery, but let’s not forget that some people do win the lottery. Every week someone wins the lottery!A near-miss would be unfortunate, but not fatal. The Result would be severe weather conditions, millions of deaths and probably a new Ice Age.Looking on the bright side, most scientists don’t believe that Planet X even exists. Even so, there are countless other ways for fate to get it’s claws into us.The year 2012 might pass uneventfully into 2013. It probably will – if we’re lucky. M1.2 Solar Flare & Earth DIRECTED CME June 13, 2012 - YouTube: " "
Welsh Secretary Cheryl Gillan has praised the 'impressive' efforts of an RAF Sea King helicopter crew caught on camera evacuating people from a flooded caravan park near Aberystwyth, west Wales, as the mammoth clean-up begins. The River Leri burst its banks overnight under pressure from the driving rain and winds of up to 70mph, as homes in villages across the area were battered by the elements. The huge clean-up operation has now started as locals, of which up to 150 were displaced, attempt to repair the damage from flood water lashing up against properties. Welsh Secretary Ms Gillan said the situation is now 'under control' and praised the 'very impressive [rescue] operations' in 'horrific weather conditions' that had earlier been caught on camera. 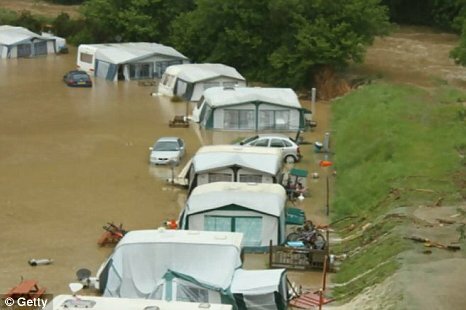 The worst-hit areas were several parks and river-side properties, including the Riverside Caravan Park in Llandre where struggling families were rescued by lifeboats and three people had to be airlifted from the roofs of caravans and other mobile and static homes. One Royal National Lifeboat Institute crew assisting in the rescue effort even became trapped themselves - prompting an RAF Sea King helicopter to be called in from the neighbouring district to pull them to safety. Earlier, the full scale of the challenge facing the rescue teams was revealed in a video taken from the helicopter, which shows emergency workers being winched down onto the roof of a static home. The building appears to be almost completely submerged as the crew extract people stranded inside, as the wind and rain swirls around - making the mission all the more treacherous. 'Those involved in the rescue mission at the caravan parks in Llandre have acted quickly and with courage,' Ms Gillan added. 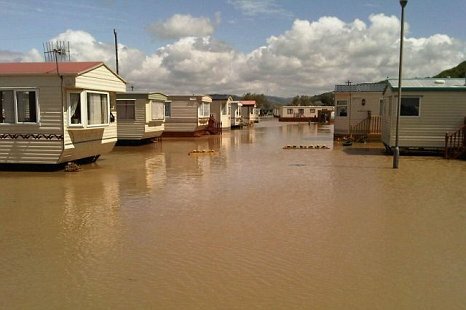 Stephen South, the owner of the Riverside Caravan Park, said everyone had been accounted for and has confirmed the operation to begin repairs has begun. 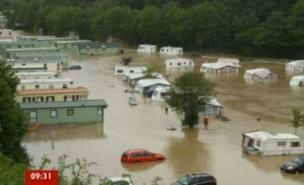 Earlier on Saturday, he said: 'At 2am the river that runs alongside the site breached the banks. 'Some people left of their own accord when water levels were around 2ft but it gradually got worse and we have been evacuating people ever since. 'They launched the life boat to get people but the force of the water swept the lifeboat into one of the buildings. The representative went on to explain that dozens of personnel from the fire service are in attendance at the scene. Many were, and continue to be, armed with a range of rescue aids, including boats as the conditions affect various surrounding areas in different ways. Measures are also being taken to stave off flooding in villages, with images from the scene showing front doors almost half-submerged beneath the water. Royal Air Force Sea King helicopters were used in the emergency operation, while lifeboats are also available to stricken holidaymakers. Another 11 people in the region were rescued from nearby Mill House caravan park at Dol-y-Bont, also in Llandre. They were attended by the fire service. 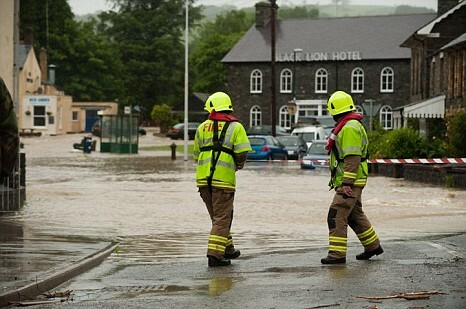 Between 4ft and 5ft of water has been reported as running through the nearby town of Talybont, leading to a crowd of about 30 local people seeking refuge in the local community hall. 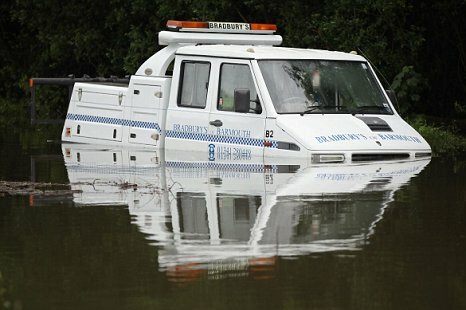 Emergency services first received a call-out with news that the water had reached serious levels at about 3am this morning. Italy: Living in an Earthquake Zone | European Journal - YouTube: " "
Venus begins to pass in front of the sun, as visible from Hong Kong, Wednesday, June 6, 2012. From the U.S. to South Korea, people around the world turned their attention to the daytime sky on Tuesday and early Wednesday in Asia to make sure they caught the once-in-a-lifetime sight of the transit of Venus.